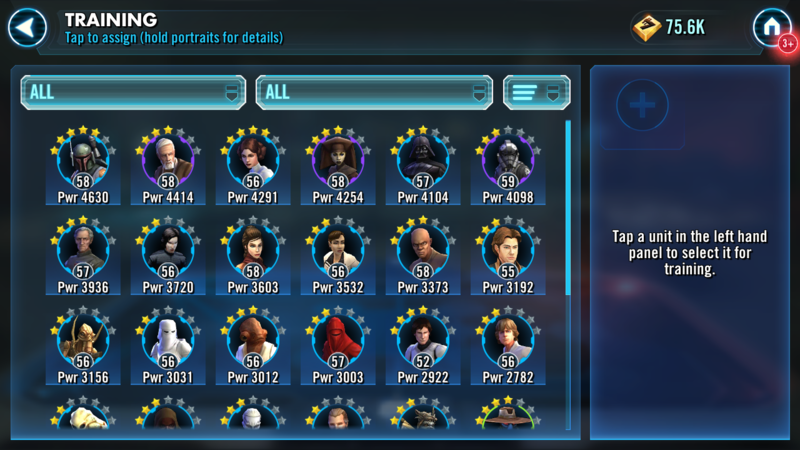 Is there a bug with GW matchmaking? over 70,000 GP with 3 G10 and 2 G8 against a top 5 of just under 22000 with barely 3 G7 characters?? Something is wrong with GW. The sooner people stop worrying about the semantics of the EXACT way it determines opponents and see the bigger picture, hopefully the faster we can get some answers. Honestly, it doesn't look like CG/EA cares that much. GW feedback is flooded with simple complaints, elaborate explanations, and tons of examples. There's no reply. Not even "we're looking into this". Yeah, what the heck?! 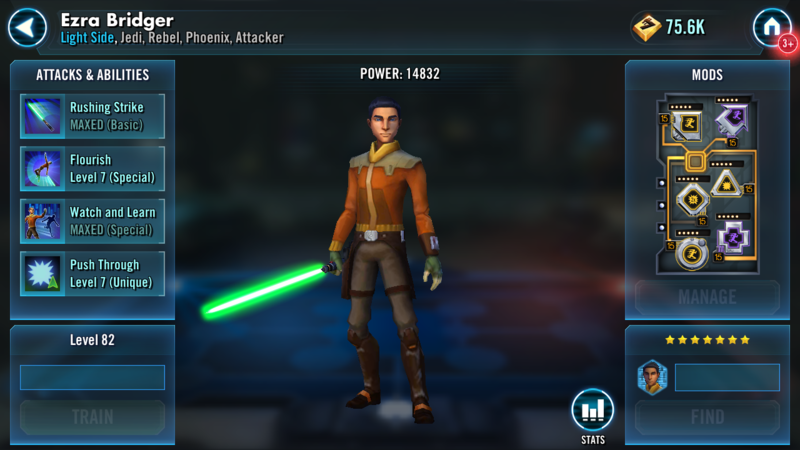 There should be a pinned response from the Devs at the top of Galactic War forum acknowledging there is a problem and letting us know they are looking into it. From that thread, they can then keep the community informed on what's being done about it so everyone doesn't feel like they are simply giving their user base the finger. And the reason they don't care much is the choir of "you're doing it wrong" and "it's always been this way" from older players who have never faced this issue in this severe form and can't fathom that something has changed. As long as the devs read five reassurances that everything is working fine from players who don't have to put up with this issue for every bug report, they're not going to act. "Older players who have never faced this issue" can still analyze well documenred complaints and give critique to the ones, where the matchmaking appears to be as designed (cases with no apparent bugs). "Older players who have never faced this issue" can still ask posters, who include no detail or documentation with their simple complaint, to provide details and documentation. Complaints with no details and no documentation is just noise and won't be taken seriously by the devs. Complaints when there's not problem and everything is working as intended is just noise. Those types of complaints just water everything down, and may cover the complaints where the complainer may have a point. And when you see documentation and details that prove there is a real problem like the 22k team facing a 70k team... then you'll gladly jump on board and support everyone that is saying there is a real problem right? And you've got no idea what older experienced players faced. Are you meeting maxxed out and unbeatable Revans the second he was in game? Didn't think so. That was our experience whenever meta defining toons like thrawn or CLS were introduced. If you didn't get them yourself at first pass there were virtually no GW wins for you for the next 3 to 6 months. GW is easier than it used to be. They did this change about a year ago. That is absolutely the reason older players don't greet these posts with the sympathy many seek. That doesn't mean it's easy, far from it, and that curve from about mid level 70's up is absolutely brutal. 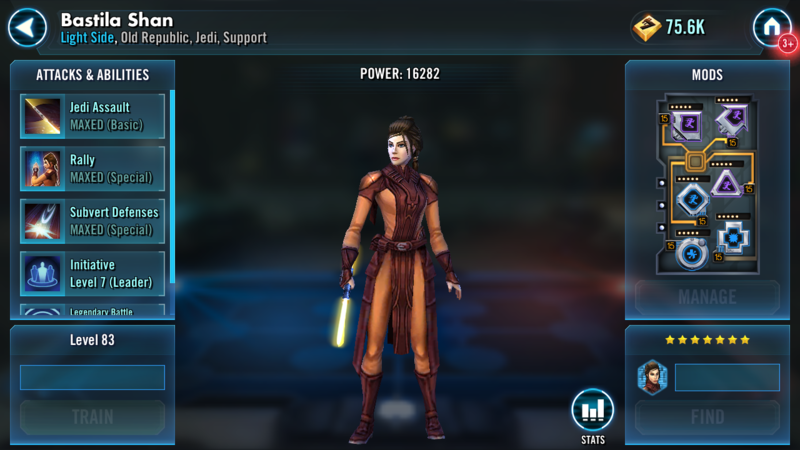 Some of us forget that and also forget that new additions like nightsisters and bastilla will present newer players with a much different challenge that you can't just throw a zeta on finn at and breeze through. But, by the same logic, you've got access to far more powerful at a low star/GP lineups than we ever did that can get the job done for you; nightsisters, bastilla jedi, resistance, first order all good examples. It is frustrating, because you probably have been doing ok but have now reached the tipping point, when you begin to hit unbeatable teams. every. single. GW. You're missing the point because of your old experiences. 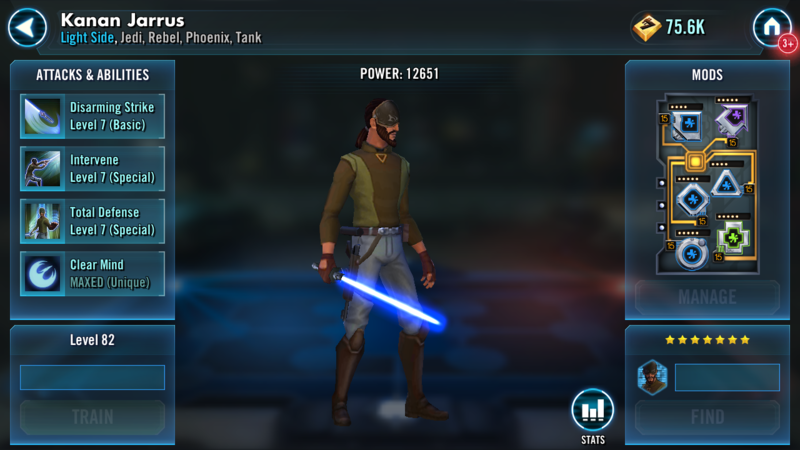 No one is complaining about a new meta character that is just really hard to beat. People are talking about being matched up with teams that are 2 or 3 times their GP. A 22K team being matched up against a 70K team. That's not the same thing as what you're talking about... even if the end result seems to be the same (not winning GW). There appears to be a new bug that has been introduced (I say "new" based on other posts and the timing that this phenomenon seemed to begin). Unless you have lower level accounts that you've been playing the last couple months and seeing it for yourself, you may very well be ignorantly claiming knowledge about something you cannot possibly have knowledge about. People that are not currently doing GW at sub level 80, should not be providing reassurance to the Devs that everything is working correctly when they have no direct knowledge of that being true. And if you were getting matched up against teams that were twice your GP "back in the day" then you should be happy to jump on board and proclaim there is a problem with matchmaking. Nothing else makes any sense. Are you actually defending poor design of GW matchmaking like it is something to be celebrated? 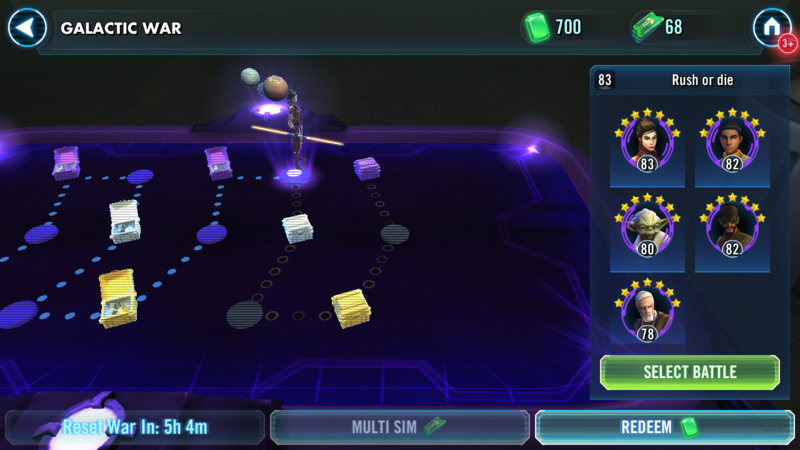 Arena teams have nothing to do with GW matchmaking. Neither does GP. 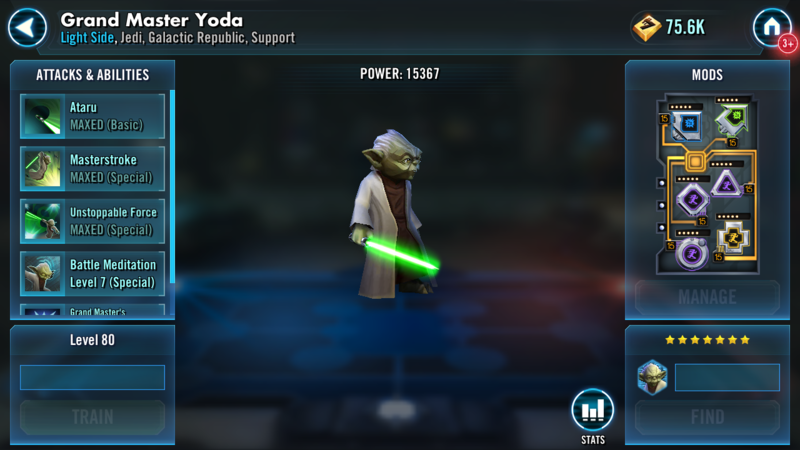 Matchmaking is still based on the old power rating called stat power of your 5 highest power toons — disregarding what your arena team is. One difference between GP and stat power is, that zetas don't influence stat power. I believe the first problem here is to understand how GW matchmaking is actually designed/implemented. If what you're saying is true (is there an official post where the Devs have explained this?) then your response is not really a defense of GW working correctly, but rather an identification of what is wrong. Do you think my intention was to defend GW design? Here I thought, I simply corrected the OP's misconception of the current GW design. Maybe I will. Maybe I won't. I will most likely just let it pass without commenting, since if there's evidence/documentation it will speak for itself. There wouldn't be anything to add and no point in commenting. Who? Me? I believe I do (even though I didn't start playing until 4 months after launch). On top of that, I also played an old alt, which had been inactive for 14 months, back up to level 85. 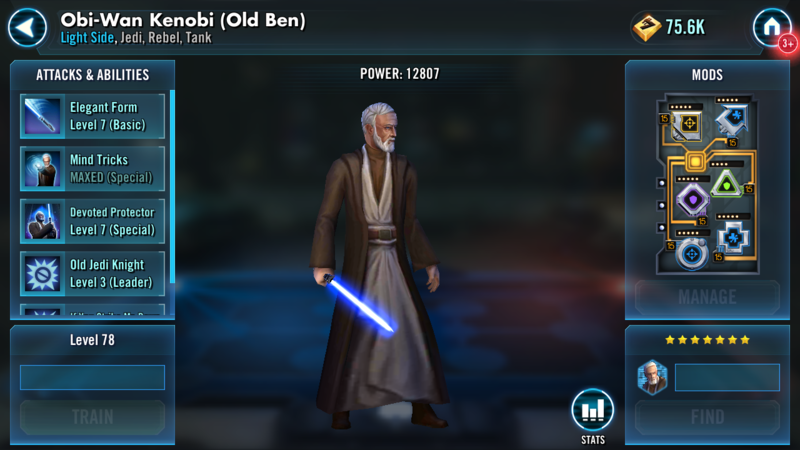 On that account I didn't unlock GW sim until June '18. You're missing the point because of your old experiences. That's the best way forward to get the attention of the developers. Can verify the bug was not remedied in today's update. Granted, they didn't say it was, but on this forum they haven't said anything. Gotta go to EA Answers to see where they admitted a bug. My son's level 62 account with a top 5 of 23,679 on Battle 7 features 34,326 According to the research battle 7 should be about 75 percent of your top 5 so it should have been in the 17-18K range. "Hi there, while I understand the frustration in regards to the GW matchup, this is not a bug." "We've confirmed with the dev team that there have been no changes that would affect Galactic War matchmaking this year. However, we did identify a bug that would cause the opponents to sometimes not match the expected difficulty." This is what we call talking out of both sides of your mouth. In other words, bug confirmed. To be fair you left out them basically saying thanks for bringing these facts and data to our attention. So there was a bug. That wasn’t definitely normal. Won the GW 2 straight days already. Thanks to the guy that posted that. And thank you all. The only thing you did was undermining the problem. You never took this seriously. By highlighting the need for documentation, when reporting? And the need to filter away all those reported cases, that clearly were no instances of any bugs? Ok. You are allowed to have your oppinion — wether it's a clever one or not. “And the need to filter away all those reported cases, that clearly were no instances of any bugs” you say. If we needed you to solve this problem, we would all be screwed, that’s for sure. You would still think that this was duo to the fact that we didn’t have a competent roster or that we weren’t just “clever” enough. “Wether it’s a clever one or not” - this is your real motivation. This is what brings you here. Just highlighting this. A. There has been several posts, where there was no real problem, and no apparent bug. Those were just 'noise' among the reports, where there seemed to be a real problem. Oh! Now I remember you. I commented on one of your reports, that you could have beaten the team you complained about, if you had developed your roster differently instead of building random toons with no strong team with synergy. I stand by my words back then. I gave you some advice in an attempt to help you. You took that quite personal — even when in other of your comments you seemed to realize/agree, that you could have developed your roster better. B. I never claimed that there was no problem with the GW matchmaking in general. "You are allowed to have your oppinion — wether it's a clever one or not." 3 days now, and no super OP teams on node 3. Either I'm lucky, or the bug was indeed fixed. There was no bug to begin with.